I have a (26424 x 144) array and I want to perform PCA over it using Python. However, there is no particular place on the web that explains about how to achieve this task (There are some sites which just do PCA according to their own - there is no generalized way of doing so that I can find). Anybody with any sort of help will do great. 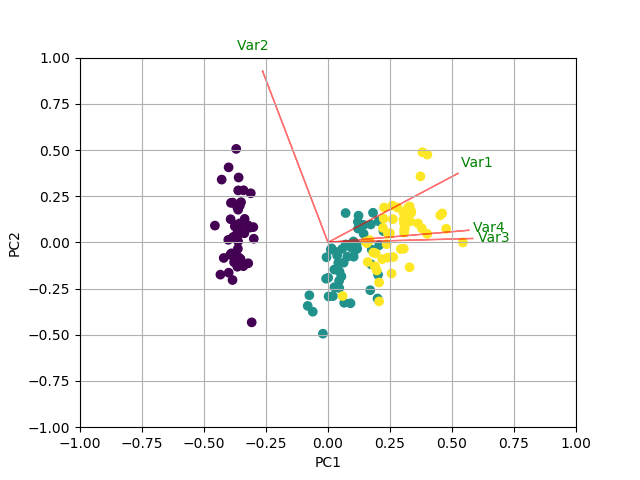 EDIT: on the blog nextgenetics I found a wonderful demonstration of how to perform and display a PCA with the matplotlib mlab module, have fun and check that blog! I posted my answer even though another answer has already been accepted; the accepted answer relies on a deprecated function; additionally, this deprecated function is based on Singular Value Decomposition (SVD), which (although perfectly valid) is the much more memory- and processor-intensive of the two general techniques for calculating PCA. This is particularly relevant here because of the size of the data array in the OP. Using covariance-based PCA, the array used in the computation flow is just 144 x 144, rather than 26424 x 144 (the dimensions of the original data array). Here's a simple working implementation of PCA using the linalg module from SciPy. Because this implementation first calculates the covariance matrix, and then performs all subsequent calculations on this array, it uses far less memory than SVD-based PCA. In the function below, the parameter dims_rescaled_data refers to the desired number of dimensions in the rescaled data matrix; this parameter has a default value of just two dimensions, but the code below isn't limited to two but it could be any value less than the column number of the original data array. The plot below is a visual representation of this PCA function on the iris data. As you can see, a 2D transformation cleanly separates class I from class II and class III (but not class II from class III, which in fact requires another dimension). Another Python PCA using numpy. The same idea as @doug but that one didn't run. As I understand it, using eigenvalues (first way) is better for high-dimensional data and fewer samples, whereas using Singular value decomposition is better if you have more samples than dimensions. This is a job for numpy. 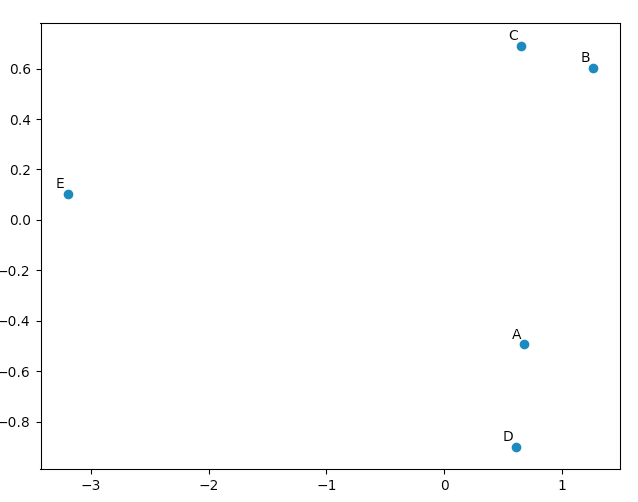 And here's a tutorial demonstrating how pincipal component analysis can be done using numpy's built-in modules like mean,cov,double,cumsum,dot,linalg,array,rank. Method 1: Have scikit-learn choose the minimum number of principal components such that at least x% (90% in example below) of the variance is retained. UPDATE: matplotlib.mlab.PCA is since release 2.2 (2018-03-06) indeed deprecated. The library matplotlib.mlab.PCA (used in this answer) is not deprecated. So for all the folks arriving here via Google, I'll post a complete working example tested with Python 2.7. Use the following code with care as it uses a now deprecated library! Now in `pca.Y' is the original data matrix in terms of the principal components basis vectors. More details about the PCA object can be found here. 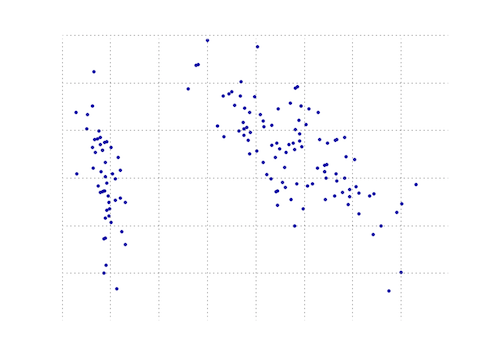 You can use matplotlib.pyplot to draw this data, just to convince yourself that the PCA yields "good" results. The names list is just used to annotate our five vectors. Looking at our original vectors we'll see that data ("A") and data ("D") are rather similar as are data ("B") and data ("C"). This is reflected in the 2D plot of our PCA transformed data. pca_mark is the pca in Mark's answer. pca_doug is the pca in doug's answer. The diffsnorm function from fbpca calculates the spectral-norm error of a Schur decomposition. In addition to all the other answers, here is some code to plot the biplot using sklearn and matplotlib. #Call the function. Use only the 2 PCs. Not the answer you're looking for? Browse other questions tagged python scikit-learn pca or ask your own question. How to get the 1st Principal Component by PCA using Python?